Located at 7800 North Orange Blossom Trail, our brick and mortar space houses our expansive inventory of sprayers, sprayer parts and sprayer accessories. 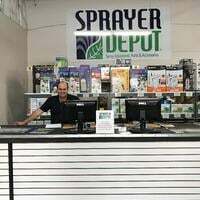 The Sprayer Depot headquarters also includes a warehouse, production and repair shop, leadership offices, and serves as the main point of shipping for customer orders. Over the past few years, we have grown into a 23,000-square-foot space. Of that space, 7,000-square-feet are occupied by our production and repair shop, which focuses on the design and development of custom sprayer setups, as well as the repair of sprayers and sprayer equipment. If you’re a Central Florida resident or guest, we would like to invite you into our showroom. Our highly dedicated customer service technicians are available to assist you with new product purchases, as well as repairs and servicing of sprayers and sprayer equipment. 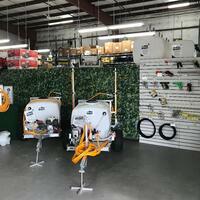 We have a selection of our private-label brand, Kings Sprayers, assembled and on display in the showroom, as well as a wide variety of Spray Guns, Tanks, and Hose Reels. Our popcorn popper is always on, so “pop” in for a look around and a snack! 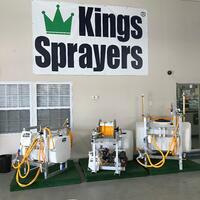 The Sprayer Depot headquarters and showroom are open Monday through Friday, from 8am to 5pm. We are closed on most major holidays, including Memorial Day. Feel free to call ahead to plan your visit: 800-228-0905. We hope to see you soon, and appreciate the opportunity to do business with you! Sprayer Depot is committed to serving you!